Recluster a jet's constituents with a new jet definition. When Recluster is constructed from a JetDefinition, it is that definition that will be used to obtain the new jets. The user may then decide if the recombiner should be the one from that jet definition or if it should be acquired from the jet being processed (the default). Alternatively, Recluster can be constructed from a jet algorithm and an optional radius. In that case the recombiner is systematically obtained from the jet being processed (unless you call set_acquire_recombiner(false)). If only the jet algorithm is specified, a default radius of max_allowable_R will be assumed if needed. Definition at line 73 of file Recluster.hh. keep all the inclusive jets. Definition at line 76 of file Recluster.hh. default constructor (uses an undefined JetDefinition, and so cannot be used directly). Definition at line 87 of file Recluster.hh. 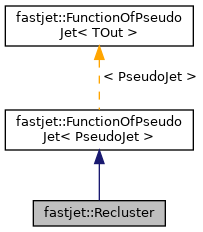 Constructs a Recluster object that reclusters a jet into a new jet using a generic JetDefinition. keep_in Recluster::keep_only_hardest: the result is the hardest inclusive jet after reclustering, returned as a "standard" jet. Recluster::keep_all: the result is a composite jet with the inclusive jets as pieces. Definition at line 104 of file Recluster.hh. Constructs a Recluster object that reclusters a jet into a new jet using a JetAlgorithm and its parameters. This ctor will always acquire the recombiner from the jet being reclustered (it will throw if none can be found). If you wish to use Recluster with an algorithm that requires an extra parameter (like the genkt algorithm), please specify the jet definition fully using the constructor above. Definition at line 51 of file Recluster.cc. constructor with just a jet algorithm, but no jet radius. If the algorithm requires a jet radius, JetDefinition::max_allowable_R will be used. Definition at line 55 of file Recluster.cc. sets whether to try to optimise reclustering with Cambridge/Aachen algorithms (by not reclustering if the requested C/A reclustering can be obtained by using subjets of an input C/A jet or one composed of multiple C/A pieces from the same clustering sequence). By default this is enabled, and should always be correct; disable it to test this statement! Definition at line 154 of file Recluster.hh. set the behaviour with regards to keeping all resulting jets or just the hardest. Definition at line 165 of file Recluster.hh. returns the current "keep" mode i.e. Definition at line 169 of file Recluster.hh. runs the reclustering and sets kept and rejected to be the jets of interest (with non-zero rho, they will have been subtracted). Normally this will be accessed through the base class's operator(). Definition at line 87 of file Recluster.cc. A lower-level method that does the actual work of reclustering the input jet. The resulting jets are stored in output_jets. The jet definition that has been used can be accessed from the output_jets' ClusterSequence. Definition at line 108 of file Recluster.cc. If ca_optimisation_used then special care will be taken in deciding whether the final jet can legitimately have an area. Definition at line 176 of file Recluster.cc.